The Weird Sisters is an absolute pleasure to read. It’s rich with literary references, girls curled up in nooks and reading for comfort and relief, and college/small-town charm. The voice of the story is unique, but rather than become a hindrance, the plural collective of the sisters (which is how the story is told), becomes like a less judgmental and infinitely more reasonable fourth sister. She lovingly relays the story of the Andreas sisters’ trials and tribulations with gentle compassion, and puts their historical and present actions into perspective. Brown perfectly expresses the subtle and competing dynamics within a family, and among siblings in particular, as they juggle to find their places within the family, and then the world. My heart was with each of the sisters as they cope with not only their own failings and setbacks, but their mother’s illness and the looming specter of death.The language in this novel is a reader’s delight. It is richly woven with savory passages and lovingly balanced portraits of the sisters. The history of the town is crystal clear and finely detailed. Barnwell sounds like a place you’d love to grow up in. This is a lovely novel. 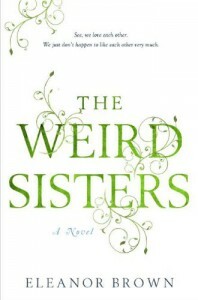 It will have you laughing and crying over the uneven relationships within this tight-knit family, and among sisters who don’t always like each other (really! ), but who certainly do love each other. Highly recommended.